By Chitaranjan Choudhury: Vikram Dev Autonomous College of Jeypore has been one of the pioneer institutes in KBK districts. The college got National Assessment and Accreditation Council (NAAC) Accreditation (B++) on 31 March 2007. However, even after eight years of getting the accreditation in the Cycle 1, the college did not receive the Cycle 2 accreditation. Educational experts in KBK districts do feel that due to the lethargy of the college authorities the college has not been able to get Cycle 2 accreditation. After getting Cycle 1 accreditation from NAAC, educational institutes must apply for the Cycle 2 within five year of getting first accreditation. Dr. Subash Rath, the then principal of the college had applied the Cycle 2 accreditation before his retirement. After his retirement, the college authorities reportedly failed to allot time slot for the inspection by NAAC team thus the application was subjected to rejection. As a result, the college was deprived of the Cycle 2 accreditation from NAAC. The up gradation of this college as university by the University Grants Commission (UGC) was shattered as the later has been considering NAAC accreditation for recognition of educational institutes. Even the college failed to implement the suggestions made by NAAC assessment team during their visit. Some of the suggestions were – bank counter in campus, e-library, research facility for the students, women education center in association with UGC, cybercafé in campus, etc.,. None of the suggestions were implemented, experts lamented. 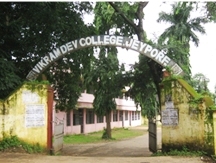 Vikram Dev College was established on 1st July 1947 as “JEYPORE COLLEGE” with 49 students and nine lecturers. The college got UGS recognition in the year 1954. The college was named after King of Jeypore Maharaja Vikram Dev Verma as “VIKRAM DEV COLLEGE” in the year 1961. The campus of the college spread across 25 acres and built-in area in 1, 12,154 sq ft (Excluding Hostels and Quarters). There are around 57,000 books in the library that spreads across 1, 60,000 sq ft. The college has been offering graduate courses (B.A.) Arts, (B.Sc.) Science, (B.Com) Commerce and post graduate courses in M.A. (History, Economics, Political Science) M.Sc. (Chemistry) and M.Com (Accountancy). Rayagada College got its Cycle 2 accreditation from NAAC while V D College deprived reportedly due to its officials lethargy. Many other educational institutions in Odisha have achieved both 1st and 2nd Cycle accreditation from NAAC but VD College.